After having a super busy weekend last week, I made more of an effort to be a fun parent. At the end of the day, some activities were more "successful" than others, but the shift in the air was certainly noticed by the kids they were quick to comment "boy, we ARE having a fun day today!" Which was really all the currency I needed to continue. 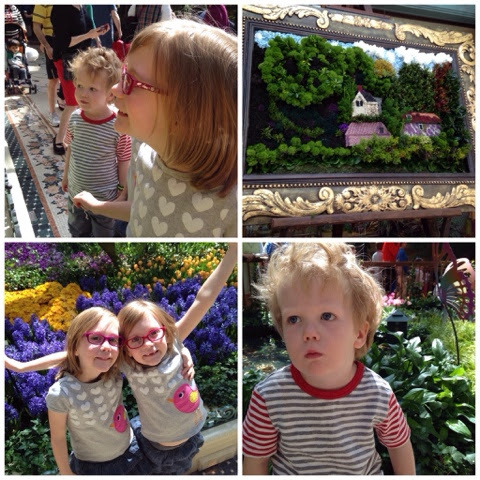 First up was the conservatory at the Bellagio. How ridiculous is it that this remarkable little five/ten minute drive is somewhere we rarely visit? 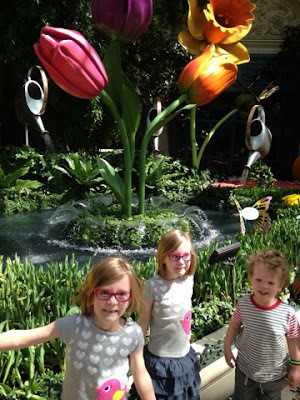 The gardens are lavishly redecorated every few months in a new theme, and it's very kid friendly, and right off the parking garage so it isn't even a lot of traipsing through smoky casinos. 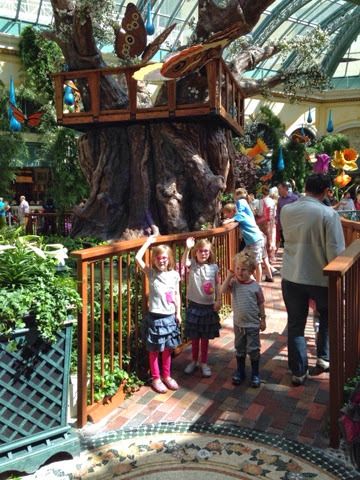 (which is my usual complaint on strip activities with kids) It's downright STUPID how little we take the kids here. This was the first time we did it on a saturday, I was a bit worried about crowds, but in the morning, it was almost the best I've ever seen. Downside is they don't have the outside fountains going, but whatever. We'll be hitting this up much more in the summer. There were tons of live butterflies in this greenhouse, all kinds of beautiful butterflies, it held some attention spans. 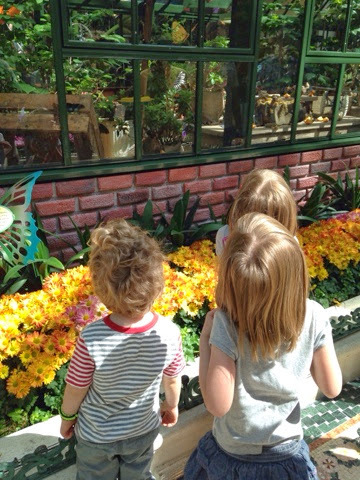 By the end, Little Man had enough of "looking at flowers." Next we headed out to the quaint little town of Boulder City for a Ren Fair. 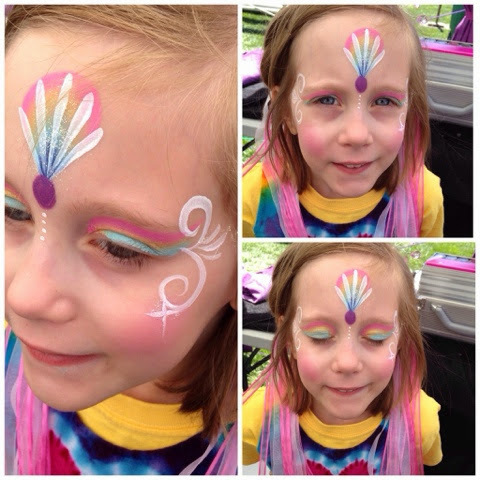 It was the first Renaissance Faire I'd ever been to, and I was a bit underwhelmed, but the kids had fun. As soon as the kids rode the impossible-for-their-age inflatable dragon, we could have some real fun. 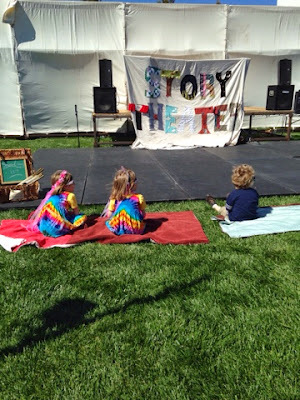 I've learned from this weekend that having fun myself is not the main goal for a good family weekend, so sitting beholding my kids watch with rapt anticipation a cleverly done children's one-woman-theatre show is just as good as... I don't know what I would have rather been doing. Not feeling like a slacker mom for once WAS ENOUGH. 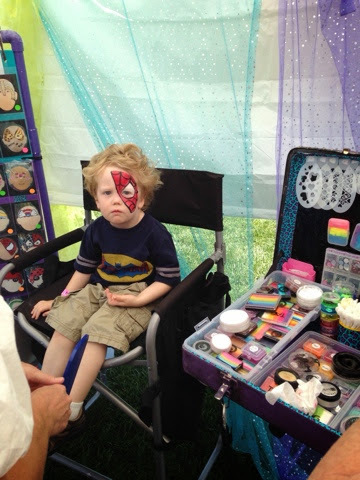 There was also amazing face painting. My child! So grown up! And beautiful! Let me go weep in a corner for a while. Funny story, the artist called us over when she was done so we could snap a reaction picture when she held up a mirror for Little Man to see his awesome and much anticipated Spider Man face. This is pretty much the face he gave her. MY SON, EVERYBODY! He does not perform for any person, and how dare you for expecting him to. As soon as we left her tent he was all smiles and would point to his face so strangers could bask in the coolness of the spiderman face. And we found Humphrey the Bunny in front of a local antiques store. I'm going to level with you here. 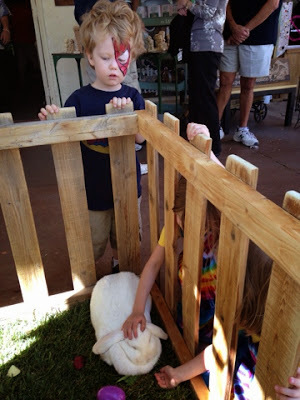 Without the Ren Fair, I think we could have hobbled along on the bunny encounter alone. They loved that darned bunny. 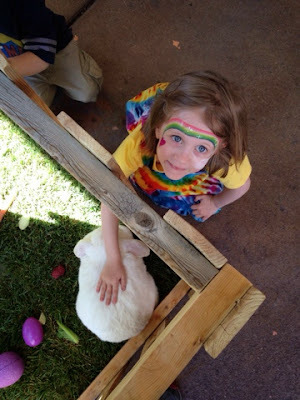 That huge bunny that seemed to, at the very least, put up with the persistent children. As we tucked the kids in bed Sunday night, each of them sighed a bit and remarked at what a wonderful weekend they had. I'm going to keep that in my back pocket for a good long while. I was a bit sad to see it slip by so quickly. Now we're firmly into Monday and I still wish we could steal away for some fun. I'm sure I'll be referring back to this post myself to be reassured that I am not, in fact, doing EVERYTHING wrong. Oh, what a fun weekend! 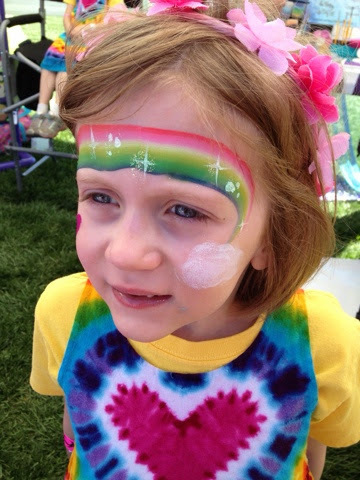 I noticed that MY mood was lightened when I started trying to do more fun things with the kids on the weekends. I'm on the hunt for cheap/free things to do now. We're going to hit the giant market that comes once a month through the spring on Sunday but I think our area Ren Fest is still going on too!